SEW Seattle 2006 was the first Search Engine (mini) conference I ever attended and one of my goals for that day was to introduce myself to Rand Fishkin. I admired Rand for being the first person to elevate themselves in our industry via blogging who was seemingly independent of Danny Sullivan (though clearly influenced by Danny). Rand had also adopted a very open and personal blogging style (pre-Venture Capital) and for myself who at the time who had written some (poor quality) blog posts and who was trying to find his own niche online, Rand had showed me the possibilities of writing that appealed to the masses yet seemed very true to himself (his My Super Proposal directly influenced and lead to my writing my Marvin Gaye National Anthem story) . As I arrived at the conference site that day, I saw a couple people from Portland that I knew (there were actually a lot more folks from Portland that were at the show that I didn’t really know…the idea that became SEMpdx started here). After I mingled with a bunch of strangers for a bit, they opened the doors to the conference room and as I walked in, I immediately noticed Rand at the back. While I was walking over to introduce myself, I noticed another guy headed towards Rand at the very same time. His face looked familiar because I had seen it frequently in the SEOmoz comments. Matt McGee and I met up with Rand at the same time and began to chat. All three of us chatted for about 5 minutes and Rand was extremely gracious to both Matt and I. We could have talked much longer but it did cross my mind that Matt and I had one of the event headliners cornered at the back of the room and I was sure that Rand wanted to network with more and different folks. So, we broke away from Rand and we talked a bit longer amongst ourselves. Apparently, Matt had started his SEM blogging career less than a month before this event…I hadn’t seen his blog before and only knew him from his SEOmoz comments, but it didn’t take me very long to realize what a cool guy he was. 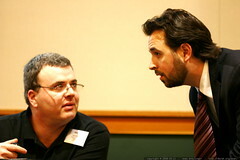 He (and Rand) were two of our featured speakers at our first SearchFest event in 2007. I remembered the aforementioned story as I followed the reaction to end of voting at Sphinn as a newly minted Sphinn editor (meaning I saw and heard a few things that the public didn’t.) Clearly, there were people who didn’t agree with the decision, which was to be expected. But some of the discourse was at such a level that I wondered whether we are now in the first generation of search marketers that is so far removed from the history of search that they see Danny Sullivan as a grumpy guy who wanted to change the rules on his search site, rather than as the guy who brought search marketing to the forefront of public consciousness. Today, our community is big enough to have many leaders. I have followed Danny Sullivan for 10 years so clearly, he’s the Godfather of Search to me. However, there are sizeable communities of people who might see Rand as its leader (or Aaron Wall or Chris Winfield / Loren Baker or David Harry). I certainly know that everyone I just mentioned acknowledges Danny and his contributions…but I wonder if all their followers do. The search marketers who were present when Sphinn started remember that being voted to the front page by your peers actually meant something (besides the link & the extra traffic). Over time, that feeling went away and the quality of overall submissions went way down, resulting in diminished participation from the people that mattered and increased participation by those just using Sphinn to get their do-followed link. Many treated the site as if it were just another Digg clone and some behaved towards the Sphinn staff (all of whom who have contributed much to our industry) as if they were common system admins, forgetting that our collective contributions help grow the industry big enough that it even includes those that are not properly respecting it. Despite some of the discouraging thing we’ve seen recently, all of us remain committed to growing and advancing the cause of our industry. liked your piece above very much and while I’ve never met Rand, he played an important part of my own SEO education when he was one of THE voices over at SEOChat, a noted SEO forum…. and David H is just down the road from me up here in canuckland….so I know him as well….Matt and David and Mike B were just in Cleveland a month or two ago at the LocalU there…which I attended too…so dang nice to meet them all in person too, eh! still, I also see newbies coming up along the trail just behind me and think that this is a damn good thing too, eh! and I just added this blog to my morning reading list too….clearly, there is much to be learned here is what I mean…so thanks Todd! muchly appreciated lad!